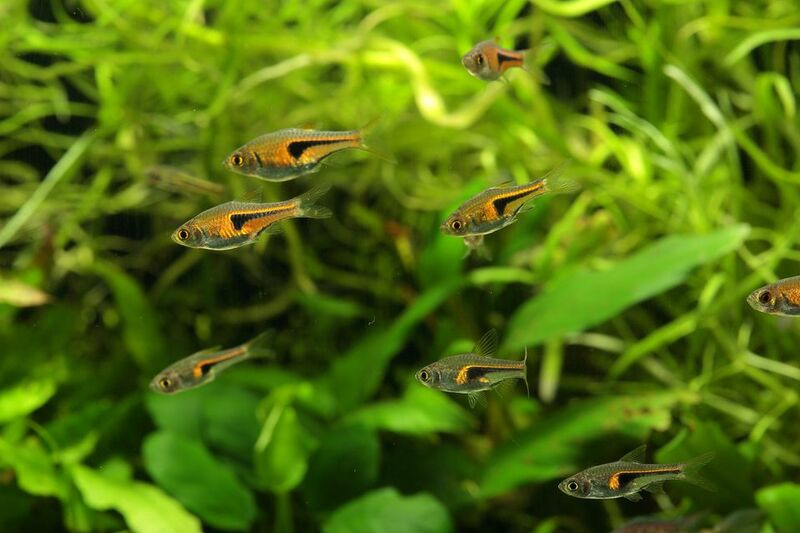 The eggs scatterers include most aquarium fishes – the Danios, Barbs, Rasboras and Tetras. Even the Goldfish is among the group of fish which scatter their eggs among plants and gravel both in nature and in an aquarium while offering no parental care what-so-ever! In fact, given the opportunity, most egg scattered type egg laying fish species will eat the eggs they have just laid and fertilized soon after the breeding process has finished themselves. Most, like the Barbs, lay adhesive eggs, which stick to plants, but some like the Zebra Danio lay non-adhesive eggs, which fall to the bottom. Nearly all eat their own eggs if given the chance. The typical spawning movement is a chase of the female by the male, accompanied by spasms of egg-laying and simultaneous sperm ejection and fertilization. Activity may continue for an hour, or in some cases like the White Cloud Mountain Minnow, for several days, but a few hours is generally the rule and is specific for each type of fish. Once livebearer young have been produced and saved from parental cannibalism, the battle is practically over; fry can hide in the plants and grow to maturity in the community tank with no assistance from the “breeder”, and this is actually quite common. The challenge is the hybridization of the frequent anomalies which come from the non-uniform broods. The challenge is in constantly inbreeding and keeping only the strongest and best-colored fry to create a better and better line, ultimately, with a little luck and a lot of skill in breeding generations of the same fish, a totally unique version of the livebearer you started with. With egg-layers, the challenge is in the breeding itself and the rearing of the young. Most of the egg scatterers, who have been tank and farm bred for many generations, are true lines. They are the way nature breeds them to look over millions of years, the challenge of breeding only the largest, most colorful and healthiest still exists, though production of identical copies of the largest healthiest adults is usually the goal. Once the eggs of an egg-laying fish have been deposited, and this may be no easy task to accomplish in an aquarium environment, and then again, some much easier than you may imagine, the battle has just begun. The eggs must be preserved form predators, parents, and disease, they must hatch, and the young must then be protected, fed and raised. Feeding may be the worst problem for the uninitiated, with predators running a close second. Therefore, unlike livebearers, where it is likely that you ended up with surviving Guppy babies in the first month of your first community tank, even before you learned how to clean the filter, a successful spawning and raising of an egg-laying species may occur in an unprepared tank, but it usually does not. It is all a question of percentage of successes. Many methods for the spawning and rising of different species of egg-layers are available, the most that can be said for many of them is that so and so did it this way and it worked for him. Every area has different natural water conditions, weather conditions, available food sources, and available native breed fish and so on. It is, therefore, necessary, especially with the egg scatterers, to list a number of general principles which are pretty clearly established, to indicate how improvements may be made in the methods of breeding, water quality and feeding of both breeders and fry to increase your percentages of success. Perhaps the best general advice is that few species are actually as particular about conditions for successful spawning as most people think, and that cleanliness, healthy fish, and proper feeding are usually more important than fussing about with PH, temperature, light, shade and so forth. Let’s add an emphasis on the term “usually”, obviously some fishes we will discuss do have specific requirements, but most are pretty forgiving in their demands if the basics are followed. I believe if you try one or more of these projects you will gain a better understanding of nature, and a greater appreciation of our gratifying hobby; fish keeping. As always if I can be of any help in these breeding projects do not hesitate to contact me, I will be happy to assist in any I can. I am here to help you enjoy our great hobby more each day!